There are some great food trucks in the city, but sometimes you just want a classic New York street food lunch. In midtown, the most well-known halal food place is at 53rd & 6th halal cart, with a big line during the day, and an even larger line at night. What’s the first rule of street food? Long lines = fresh food. The menu is simple: chicken, “lamb” or a combo over rice or on a pita, with white sauce and hot sauce at your option. The combo platter cost $6. Even though the line was about 15 people long when I walked up, these guys work really fast, and I waited less than 10 minutes. In fact, the guys work so fast, I couldn’t tell him to leave the lid off in time, and it got a little smushed. That didn’t affect the taste though. I started with the “lamb”, which is that giant spit of minced meat you see at these carts. After being cut off the spit, the meat is grilled, with some of it getting crispy. The meat is a bit saltier than I like, but the white sauce helps even that out a bit. Most of the hot sauce was put on the lamb, so those bites got pretty hot too. The chicken was more to my liking. You can see its actually real chicken, cut up and grilled nicely. Underneath the meat, there was a lot of yellow rice, which made a pretty good base. It was cooked the right amount, and had a nice flavor to it. The platter also came with 2 pieces of pita bread, which were soft and warm. Both pieces only equaled about half a pita, but there was so much food, that was enough bread. 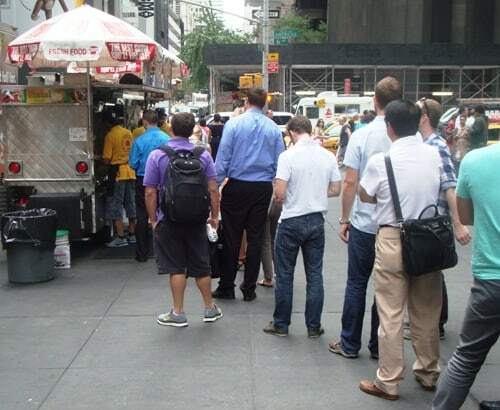 The 53rd & 6th Halal Cart is on the SW corner of…53rd & 6th. One cart is there during the day, and another (different?) one comes at night, from 7:30pm-4am. There’s also a similar cart with a line on the SE corner, and another one on 52nd & 6th, a block south. All these different stands have yellow shirts and yellow bags, so it’s kind of hard to tell whether they have the same owner or are copycats. No way you’re going to get a straight answer from the guys working, assuming they even know. Does it matter which one of these carts you go to? Are they different or the same? In our opinion, they are pretty similar. We were thinking of possibly trying each of the different carts on consecutive days, but didn’t want to end up like Morgan Spurlock in Supersize Me, in the hospital and gaining 30 pounds. This food is fun once in a while, but you can’t do it every day. Well, maybe you can, but I can’t. Looks like you went to the “imposter” cart. The Halal Guys are on the SE corner and their shirts and cart says Halal Guys with the web address. I’ve had The Halal Guys before (on 53rd & 7th and 52nd & 6th) and didn’t see much difference. Do you see that much difference between these carts. Never had the other carts. Only had Halal Guys twice and the chicken was rather tasteless. The white sauce was clearly higher quality than generics, but I think the cart is quite overrated.